I keep having to push back P90X workouts because of my ridiculous work schedule, so in order to keep up with my training calendar, I had to do two workouts today (Legs & Back as well as Cardio X, which I have used to replace Kenpo). Consequently, I no longer have use of my legs anymore. It looks like tomorrow is going to be an elevators-only kind of day. On the bright side, I survived my 24-hour shift over the weekend, as did all of my patients. Great success, everybody! And now, back to our regularly scheduled programming. When I was a kid, I wanted to be a paleontologist. DUH! Who didn't? My favorite period was the Jurassic period and my favorite genus was the Apatosaurus, commonly known as the Brontosaurus. 1. It was one of the largest land mammals that ever existed, weighing approximately the same as four elephants. 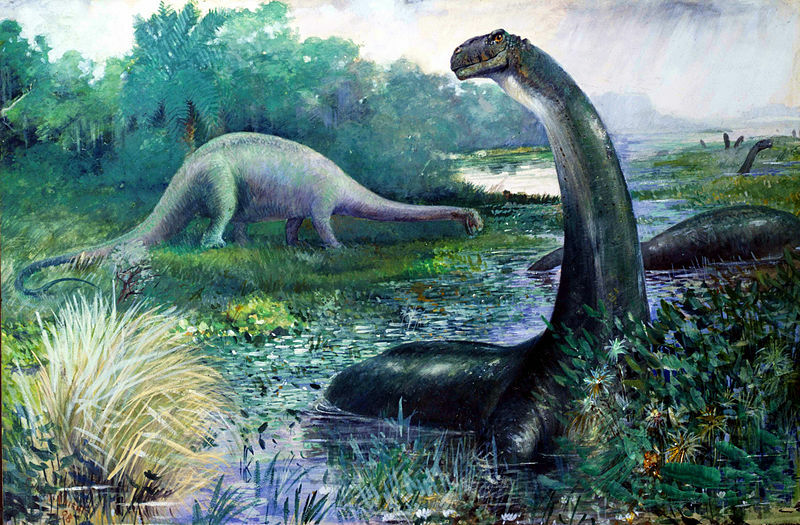 In fact, it was once believed that the Apatosaurus was too large to support its own weight and must have lived partially submerged in swamp water, as pictured above (this is no longer believed to be true). Anyway, little kid obsessed with giant dinosaur: it just makes sense. 2. It was an herbivore. A gentle giant, if you will. Notice how mean the Tyrannasaurus Rex and the Velociraptors are in Jurassic Park, yet how happy Timmy and Lex are when they awaken to see the Apatosauruses feeding. 3. 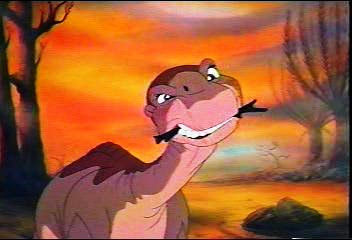 One of my favorite childhood movies was The Land Before Time, and Littlefoot just happens to be a Longneck. What an endearing character! His bravery against Sharptooth, his love for treestars, his mistaking of his own shadow for Mama Longneck... it brings a tear to my eye. Hmm, all this reminiscing makes me really want to watch the movie again. Also, FernGully: The Last Rainforest. Ooh ooh, and also The Brave Little Toaster! When I left work last night, I labeled a leftover sandwich from lunch with my name and placed it in the refrigerator in the Family Medicine resident workroom. When I went to eat it at lunchtime, it was gone. Who could have done it? What mean, evil, conniving person would take a sandwich that they knew belonged to somebody else!? How did it taste going down with a side of guilty conscience?? We had sandwiches again today for the PGY2 Practice Inquiry lunch. This time, I wrapped my sandwich in a napkin with a decidedly more aggressive label. KEEP YOUR HANDS OFF, SIR OR MA'AM! On second thought, maybe Titan was the one who sneaked into the resident workroom and ate my sandwich. I did forget to feed him this morning when I left for work, after all. I'm such a terrible father! It's no secret: I love True Blood. I can't help it. I'm obsessed with vampires and werewolves. Well, except for the ones in Twilight. They're lame. Back to what I was saying: I love True Blood. But I also kind of hate it. The plot is great, which is what keeps me watching after all these seasons. The main characters, on the other hand, are downright terrible. Bill is too whiny, Sookie is too indecisive, Tara is too psychotic, and Lafayette is just too... everything. The one friend I have on the show is shapeshifter Sam Merlotte. 1. It would be an easy transition. Sure, I'd have to change my last name, but everyone I'm friends with could continue calling me Sam. What a noble and distinguished name, I might add. 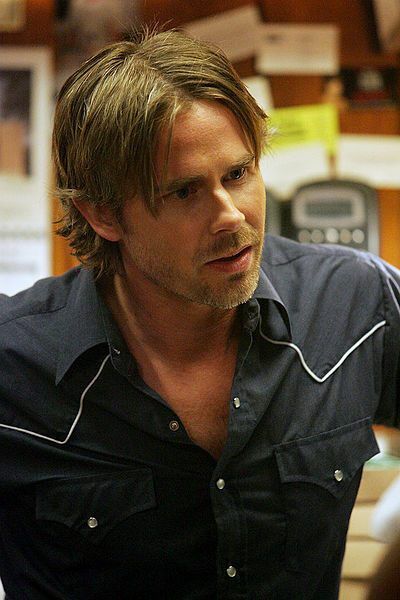 Aside: Sam Merlotte is played by actor Sam Trammell on the TV show. 2. His preferred shape is a collie. My preferred pet is a husky. Okay, not quite the same thing, but pretty close. We're obviously both dog people, which means our personalities are probably very similar. 3. He owns a bar. Did you know that it has always been my dream (okay, at least since I started college in 2004) to own a restaurant on the Corner? Seriously, I would quit medical school right now if you handed me the keys to Boylan Heights or Sushi Love. JUST GIVE THEM TO ME. Kthx. So there you have it: three good reasons I could (and should) be Sam Merlotte. I started the week off on a nerdy post, so why not continue the trend? Between the ages of 7 and 10, I was obsessed with Mighty Morphin Power Rangers and its sequel, Power Rangers Zeo. Then my beloved characters started going into space and being reincarnated as samurai and undergoing all sorts of crazy other iterations that were too absurd for even my prepubescent maturity level. So I stopped watching. But when I loved the show, I really loved the show. And my favorite character was the Billy Branston, the Blue Ranger. Why? Funny you should ask; I was just getting ready to tell you. 1. His costume was blue. Blue is still my favorite color, but when I was a kid, I'm pretty sure it was the only color I knew existed. I had no need for the Crayola box of 64 crayons. I just needed the set of eight, as long as all eight were different shades of blue. 2. He was the stereotypical nerd. He was a member of the Angel Grove High School science club, he got beat up by Bulk and Skull all the time, and unlike all of the rest of the Power Rangers, he wore glasses. What isn't there for me to identify with?? Although, I never understood how he was able to see clearly after he morphed. Did he have prescription lenses in his helmet? If so, how do I acquire headgear of this caliber for myself? 3. He was a gadget geek. While I liked playing with electronics, he actually made them. He fashioned the communication devices for the team, he created a virtual reality simulator, and perhaps most memorably, he was able to disable Alpha's self-destruct mechanism after it had been activated. Just try and pretend like that's not the coolest thing ever. 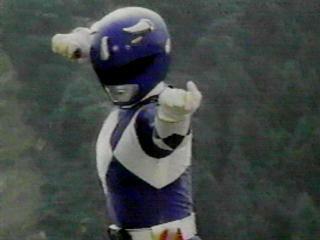 Blue Ranger, you are so cool. So cool that when my friends and I made an end-of-year video for Jubilate during my third year of college, I dressed up as you. Sure, I may not have fit into your child-sized costume, but you can't say I didn't try. Special thanks to Russell for going through the archives in his external hard drive to find this oldie but goodie. Last night, Lee and I caught the late showing of Captain America: The First Avenger. We watched the 2D version, because 1) I refuse to pay more than $10 to see a movie, 2) I hate wearing those stupid glasses, and 3) I am morally opposed to 3D movies in general. 1. The story. 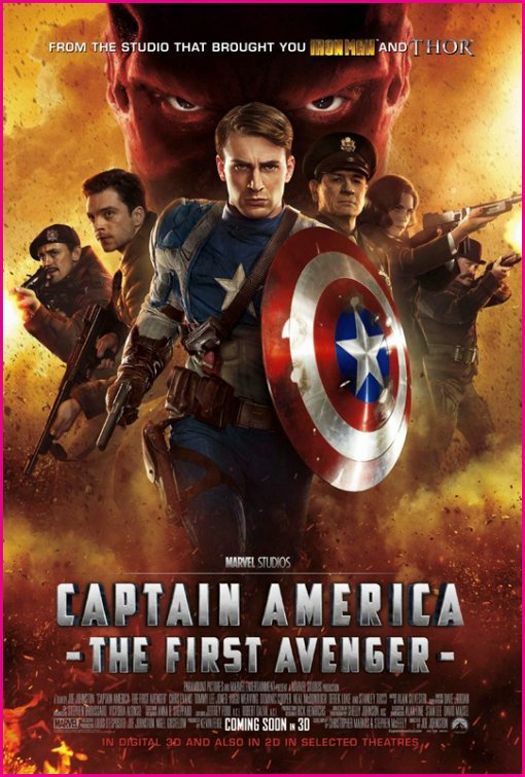 Of all of the big superhero movies to come out so far, Captain America is the one I knew the least about. I mean, I knew that he was really strong and had a cool shield, but that was about it. I have no idea how true the plot of the movie was to the original comics, but either way, it was pretty entertaining. 2. The acting. All of the characters were fun to watch. Especially Red Skull, as played by Hugo Weaving (aka Agent Smith). So cold and sinister! Although the "love story" between Steve Rogers and Peggy Carter left a little something to be desired; it was about as believable as the "love story" between Thor and Jane Foster. 3. The montages. There were a lot. But they were so well done! I especially liked the one set to Star Spangled Man, a song that really captured the feel of patriotic American songs from the 1940s. Hats off to you, Alan Menken. 1. The action. What's wrong with asking for fewer explosions and more hand-to-hand combat scenes? I mean, isn't that what Captain America is known for anyway? I'm not complaining about the cool weapons they had in the movie, I just wish we got to see Captain America show off more of his expertise in the martial arts. 2. The jokes. I'm sorry, but I didn't think any of the one-liners in the movie were all that funny. Iron Man had Tony Stark and Thor had Darcy Lewis. Captain America had... nobody. Who knows, maybe the movie was written using 1940s humor and I just didn't get it. 3. The patriotism. Or should I say, the lack thereof. Come on, this is a movie about the United States taking down the evil German Nazis! All I want is some more unabashed national pride. Wave that red, white, and blue! This is Captain America, not Captain Non-Governmental Organization with Apolitical Multinational Humanitarian Interests. Sometimes, T9 Word is not your friend. Hm, it's been a while since I've posted on this thing. Let's see if I still remember how. Neil is doing an away rotation at Georgetown, so a bunch of us drove up yesterday to hang out with him. We were only there for a total of 21 hours, so the only way we could maximize our experience was to sleep no more than 4 hours. And we managed to cram more fun into those 17 waking hours than I ever thought possible. First, we braved the oppressive heat to go out in the city, which I've never actually done before. I'm not exaggerating when I say that it was oppressive; the sign in front of the SunTrust bank informed us that despite being midnight, the temperature outside was still 90°F. My favorite part of the night was walking past some random construction equipment near the side of the road. Of course, this made for a perfect Kodak moment. When we finally decided to quit the bar scene, we made our way over to Jumbo Slice Pizza, known for its enormously sized servings. It was quite delicious and quite filling. Notice how one serving takes up two standard-sized paper plates. I wasn't able to finish eating the crust and angrily threw it down on the ground, much to the ire of Josh and the rest of my companions. It was past 5am by the time we finally settled into Neil's tiny apartment for some sleep. It wasn't easy fitting seven guys into one room, but somehow we managed. For some strange reason, Randy actually called dibs on sleeping on the floor of the closet. We woke up at 9am to the sound of my alarm, which I don't remember setting. After grabbing some not-cold-enough Gatorades from the CVS next door, we ventured toward the Metro to fulfill Neil's and my dream of going to the National Zoo, one of my favorite places on Earth. Aside: Neil and I overheard a six-year-old girl in front of us on the Metro station escalator, who stated very matter-of-factly: "Mommy, I can't believe we went the wrong direction and now we're going to the zoo." The day got off to a slow start, as we didn't see a single animal for the first 20 minutes. We then learned that it was too hot for most of the outside animals, and we ended spending most of the rest of the day at the indoor exhibits. Sadly, my camera was running low on batteries, so I didn't get many pictures of the animals. But I simply had to snap one of this cute and incredibly lazy panda. The most exciting moment of the day took place when we went to see the Great Apes. One of the female gorillas threw a ball into the air, and while we watched it fly, she ran towards us and slammed her body into the glass. I'm pretty sure we all jumped back, except for Neil, who Randy instinctively pushed forward as a sacrificial offering. Suddenly, the premise behind Planet of the Apes didn't seem so absurd anymore. After grabbing dinner at Ray's Hell Burger, which I highly recommend to any burger lover out there, we decided it was time to hit the road. Now that we're back and our adventure is over, I'm ready to sleep for a good 12 hours. Maybe tomorrow it will be less than a million degrees, and I won't have to drink two gallons of water in one day just to make up for insensible fluid loss via perspiration. Golden weekends are just that: golden. To take advantage of the golden weather we were having, I decided to venture out to Sugar Hollow, and I managed to coerce Coop, Josh, and Lindsay to come with me. Lindsay's dog Alfie is notorious for not getting along with big dogs like Titan, but once they got used to each other, they actually did surprisingly well. It was funny watching Titan leap over Alfie, who was just putzing along the trail. It was also funny to see Alfie out in nature, where he made it very clear that he would not be submerging his beautifully groomed fur in a random body of water running down the side of a mountain. We saw a couple of snakes out during the hike. Unfortunately, I'm no Mark Trail, so while some of the people we ran into warned us of copperheads, I can neither confirm nor deny this. I took a picture of one of them, so can any of you naturalists out there identify this sucker? Haha, I accidentally typed "naturist" at first, but then I remembered that "naturist" and "naturalist" are two very different things. To nobody's surprise and probably to everybody's chagrin, I insisted that we get one picture together before we went home. Alfie vehemently opposed this plan. Funny story: I asked a random guy to take the above photo. Just then, another random guy walked up and asked, "Do you want me to take a picture of all of you?" We laughed and told him that we were already getting a picture of all of us. He quickly replied, "Well, do you want me to take a picture of all of you and a stranger, then?" Haha, clever! Last night, Tina organized a group of us to go to Blue Light Grill & Raw Bar for Charlottesville Restaurant Week. For those of you who have never lived here, Restaurant Week is a week-long semi-annual event in which upscale eateries create three-course meals for the low price of $25 with an extra $1 going to a local charity (this year it's the Blue Ridge Area Food Bank), bringing the total advertised cost to $26. For my 1st course, I had fried oysters in preserved lemon tartar sauce. It was tasty, but I wish there were a way to make the breading crispier. Frying it for any longer would probably have ruined the tenderness of the oyster, but hey, I've reserved the right to be picky about my food during Restaurant Week. I also exchanged a fried oyster to try a few of the Prince Edward Island mussels in coconut milk, red curry, and lime juice that Lee ordered (not pictured). To be honest, I think I enjoyed his appetizer a little more than my own. Food envy, you win me! For my 2nd course, I had to go with the jumbo lump crabcakes with jalapeno/hominy grits and green tomato relish. This is where I think the Restaurant Week deal actually came into play. While the menu said "crabcakes," I only received one (singular) crabcake on my plate. I'll forgive them, though, because what this dish lacked in quantity it certainly made up for in quality. Then again, I've never met a crabcake that I didn't love, so maybe I'm not the best judge. What the meal lacked in quantity I also made up for with Wei's leftovers. He had ordered the buccatini pasta with littleneck clams, white beans, local sausage, and spicy tomato broth. Unfortunately, he was smart enough to finish off all of his clams and sausage before he gave the rest to me. I can only attest to the deliciousness of the pasta, which certainly left me happy and sated the way only carbs can. Personally, I thought that the spicy tomato broth could have used even more spice... but that's just me. For my 3rd course, I ordered the dark chocolate terrine with blood orange sorbet and hazelnut brittle. I don't have much of a sweet tooth, and I can't even remember the last time I ordered dessert at a restaurant, but how do you turn down something as delicious as this? It was the richest thing I've ever tasted, and I'm pretty sure it's what tipped me from being "sated" to "stuffed." I'm also not quite sure why it was delivered to me like below. I'm going to blame Heidi, who must have stolen a bite of it before I got to snap a photo. Of course, being stuffed is no reason to stop eating. Greg didn't care for the rest of his Mexican Coke float with vanilla gelato and shaved chili-infused dark chocolate, so I gave it a try. I couldn't finish it off for him, either, because it was basically a glass full of foam at that point. I did enjoy the taste of the Mexican Coke, which is made from sugar cane and not corn syrup like its American counterpart. All in all, a very worthwhile experience. I washed my meal down with a Lagunitas A Little Sumpin' Sumpin' Ale, which the waitress accurately described as a mix between a wheat beer and an IPA. Once you added in the cost of the drink, tax, and tip, my $26 meal came to a $40 total. It was more than I had expected to pay, but that's always what happens with Restaurant Week. Now I can finally cross Blue Light Grill & Raw Bar off of my list of Charlottesville restaurants to visit. Honestly, I probably won't be going back anytime soon because of the exorbitant menu prices, but I'm glad that I'll always have memories of last night's delicious meal. I just saw Harry Potter and the Deathly Hallows, Part II and it was, in a word, impeccable. Mostly because I watched Part I last night and was reminded of how it served simply as a set-up for the final film of the series. But the finale was SO GOOD! It basically consisted of two hours of nonstop action. That is to say, all the wizardry and witchcraft a muggle like me could ever wish for! 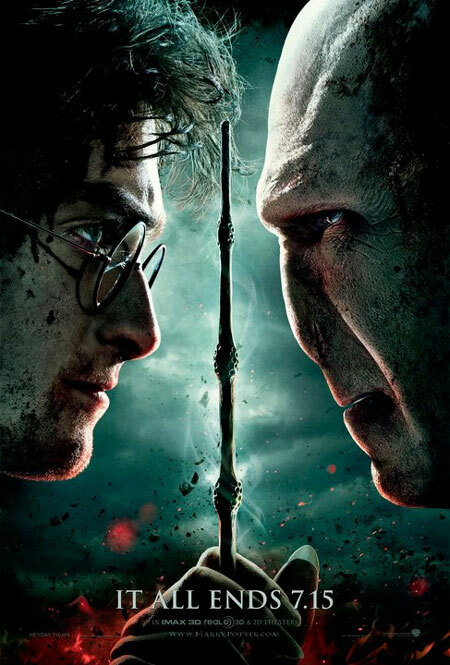 It's sad to see the Harry Potter movie series come to an end. I remember when he was first introduced by JK Rowling as an eleven-year-old boy in 1997, the same year I turned eleven. It feels as if we've grown up together, but while he stays 17 years old forever (barring the cheesy Epilogue that I refuse to acknowledge), I have to grow up and become an adult. We can't all be destroying horcruxes and battling the Dark Lord like little boys, you know. We had no admissions today, which makes it the first day since I've been on the service that we've had less than three admissions. We finished sign-out at 6:30 today, which makes it the first day since I've been on the service that I've worked less than 13 hours. So you know what I said to myself as I casually strolled out of the resident workroom this evening? 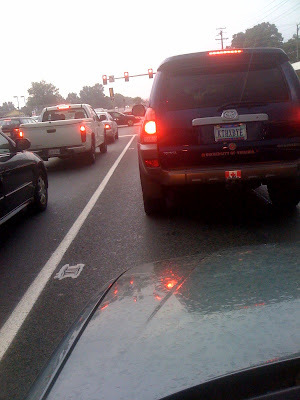 Special thanks to Paul, who risked life and limb during a torrential downpour to get a shot of the world's greatest vanity plate for me. Unfortunately, this is not Family Medicine clinic. Oh, how I wish it were. This is Family Medicine inpatient, which means that there's only one team, and we admit patients every single day. That's right, we don't take Q4 or Q3 or even Q2 call: we take call every single day. And when patients are admitted overnight, guess who gets to pick them up in the morning? The only Family Medicine inpatient team, which is... oh yeah, us. So I trust you'll understand if my posts this month are few and far between. Because they will be. And now it's time for me to go back to the hospital to read up on the two patients that we admitted at 5:30. And maybe when I present them tomorrow I won't sound like I'd never done a presentation in my entire life like I did this morning. That would be nice. Goodbye, weekend of lazing on the couch and frolicking through amusement parks. Hello, month-long Advanced Clinical Experience in Family Medicine rotation. Goodbye, going to sleep at 3am and waking up whenever I feel like it. Hello, walking the dog at 5am before getting to work by 6am and staying till 7pm. Goodbye, walking around the house in my boxers. Hello, dressing professionally and wearing a white coat. Goodbye, hanging out with friends all day. Hello, hanging out with adult patients all day. Sigh, this past weekend was fun, but all good things must come to an end. At least I get every weekend off this upcoming month. So... who wants to go to Busch Gardens next Sunday? ZOMG, I am exhausted. I just got back from spending an entire day at Busch Gardens Williamsburg with Nick, Lindsay, and Sunny. Laura met us at the park, bringing our group to a delightfully tacky total of five. As it turns out, this number is not ideal for any rides; however, it is ideal for maximizing lulz. It had been almost six years since the last time I visited Busch Gardens, and quite a bit has changed. Sadly, they have taken down the Big Bad Wolf, the first "big kid" roller coaster I ever rode. I'm looking forward to the Verbolten that they're going to build in its place by the 2012 season. This was also the first time I'd been since they'd installed the Griffon, so obviously we had to ride it three times. Note: the five seconds that they hang you at the top of the 90-degree 205-foot drop are amongst the most terrifying moments of my life. In addition to enjoying fun rides, we also enjoyed delicious nomz. We all had our own poisons, whether it be funnel cake, sundaes, turkey legs, waffle cones, or in my case, German Death by Chocolate Cake. It's not actually German chocolate cake nor is it death by chocolate cake. But it is chocolate cake, it is found in the Germany section, and it does kill me every time I try to eat it. So there. Somehow, my camera managed to survive all of the water rides that threatened to kill it. I also managed to try to get at least one group picture to capture the fact that we were all there today to enjoy the most beautiful weather and the shortest lines we could ever hope for. And where better to capture that joy than at the grape-stomping station? Now I would like to draw your attention to the witty title of this post: Amuse-Busch. Doesn't it look and sound just like amuse-bouche? Ladies and gentlemen, please put your hands together for SAMMAS THE SPECTACULAR! I can't believe I did it! Josh and I took Step 2 CK yesterday, and now I can proudly say that I have no more tests left to take in medical school. It's almost enough to make the nine-hour exam bearable... but not quite. I have to say, I really appreciated all the texts I received when I checked my phone during breaks in between sections. And not just the well wishes, but also the one from our property manager asking when the repairmen could come over. The little distractions are nice, you know? 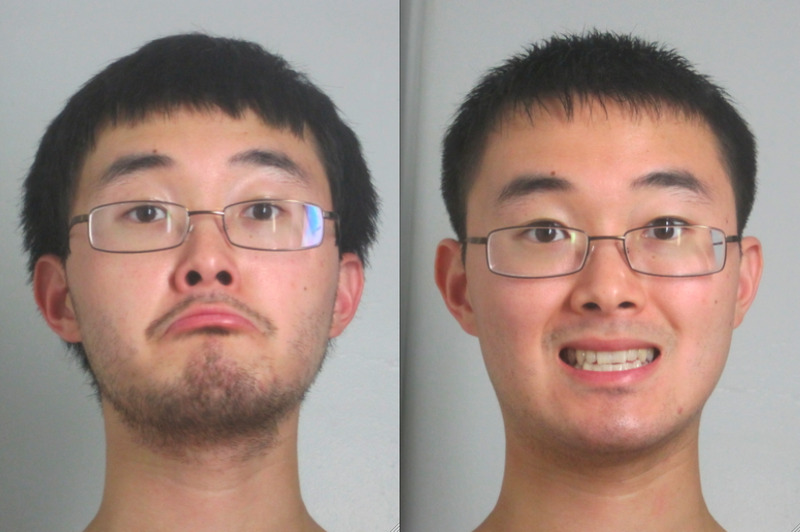 After the test, Josh and I shaved off our respective facial hairs. Then this afternoon, Lee and I went to go get our respective hairs cut. And suddenly, I feel like a real human again. At least I look more like one. 24 hours from now, I'll be over halfway through my USMLE Step 2 Clinical Knowledge exam. I'm not gonna lie, I think I still have PTSD (post-test stress disorder) from taking the USMLE Step 1 exam at the same testing center. Nevertheless, what must be done must be done. Please pray for me tomorrow... I know I'll need it! And so ends my love affair with milk and cheese. I came to the realization earlier this week that I'm lactose intolerant. It's very sad, but it's very true. For the past few weeks, I've been feeling gassy and bloated all day. I'd hear borborygmi (I love that word!) as I sat in the library, studying. And when I tried to work out, it felt like my intestines were doing flips and turns inside of my abdominal cavity. Well, earlier this week, I ran out of milk and bread, so I replaced my morning milk and cereal with a breakfast bar and I replaced my turkey and provolone sandwich with leftovers for lunch. And ever since I took the dairy out of my diet, my digestive system has gone back to normal. I guess it's not all that surprising. 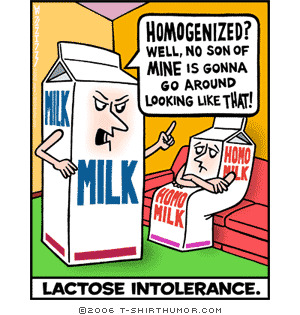 Lactose intolerance is more common in people of Asian descent, after all. But it's just not fair... Tony Horton keeps yelling at me to stop eating pizza and donuts, and now my own body is telling me to cut back on the dairy. Whatever happened to the Apple Jacks mentality of "we eat what we like"!? Over the past few days, I've really let myself go. Well, at least in the sense that I've decided that shaving each morning is no longer of paramount importance. In fact, I haven't done it since last Tuesday, when I met with Dean Pearson to discuss the Medical School Performance Evaluation, which is part of the residency application process. Don't worry, my facial hair is really nothing to write home about. But it's a promising start to what I hope will one day be a full throttle fu manchu mustache when I'm 60 years old. Here it is in all its glory (and in front of a Paris background that I chose from my Photo Booth application). Ahem... bonjour, mes amis! Anyway, imagine my surprise when I saw Josh for the first time in weeks and discovered that he, too, had stopped shaving in anticipation of Step 2 CK! We probably looked like a pair of hobos walking into Jim and Mary's Fourth of July party, but oh well. 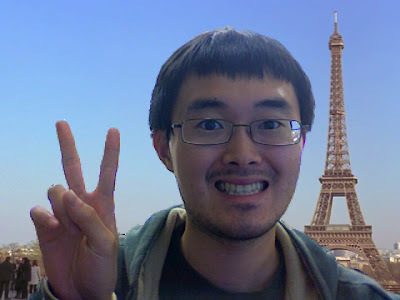 I promise I'll get rid of the scraggly beard (and get a much-needed haircut) after I'm done with this exam. EDIT: Just noticed that some of the hairs in my beard are blonde. What is happening to me?? 1. We can use the yoga room in the Walker Square gym, which provides us with a TV, a mirrored wall, and lots of space to do exaggerated lunges. 2. It gives me someone to talk to during the workout. And by "talk" I mean "complain about how annoying Tony Horton is." 3. Sunny always makes me go deeper into horse stance when I try to be lazy and cheat. 4. Sometimes, Sunny and Tri make me dinner after we finish exercising. Lamb, larb, guacamole, you name it! Uh, I just noticed how similar the words "lamb" and "larb" are. Weird. Sigh, just thinking about it is almost enough to make me want to do a workout right out. But then I try to stand up from my chair and I remember that my entire body is sore. Nope, definitely going to enjoy my rest day to its fullest extent. Have you been thinking about adopting a kitten or a puppy but just haven't made the leap? Well, hesitate no more: this is the week to do it. The Charlottesville Albemarle SPCA is waiving its adoption fee for the next few days to celebrate five years of being a no-kill shelter. Hmm, a new pet for free? I'll take five!